Hello everyone, this is AceOnline team. First of all, there will be a pop-up screen including new policy when the laucher is shown. There will be "I agree" and "I don't agree" ﻿as a below screenshot. 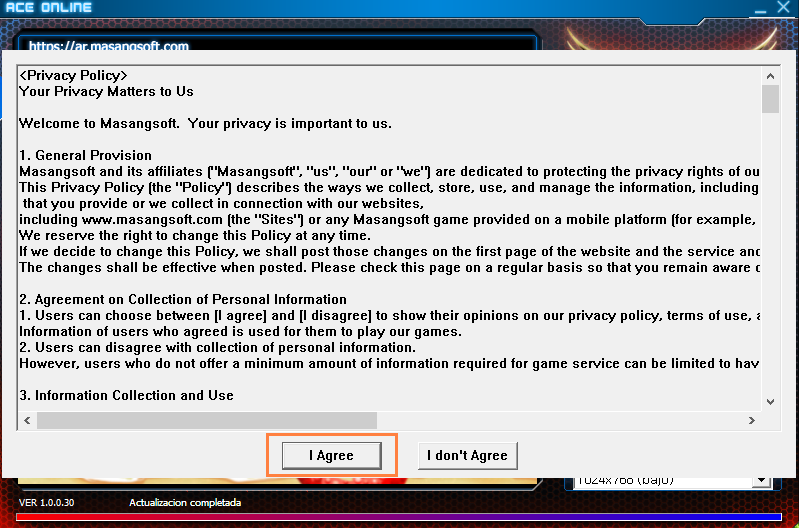 If you click "I agree", the agreement pop-up will be disappeared, you can log-in through the launcher. It will be little bit more complicated than past, but for observing international regulation, we would like to ask for your cooperation. Thank you for your interest in our game, always. There will be server maintenance on May. 30th. 2018. Here is a information regarding german server's influence error. Because of today's server error, all the influences of german server were initialized, so we couldn't make leadership in this week. We're very sorry for this inconvenience caused and we will proceed to make a leadership in further maintenance. Once again, we apologize that you've experienced this problem. Thank you for your interest in our game every time. Please take below added article into refernece. There will be server maintenance on May. 23rd. 2018.